2014 Academics’ Choice BRAIN TOY Award Winner! SEATTLE, WA (May 1, 2014) – OOZ & OZ is pleased to announce that its Morph-O-Scopes “Sports of All Sorts” Kit has been honored with a 2014 Academics’ Choice Brain Toy Award, a prestigious seal of educational quality, reserved only for the best mind-building media and toys. The independent Academics’ Choice Awards program and its seal of excellence are recognized worldwide by consumers and educational institutions as a mark of genuinely effective learning tools that stimulate the mind, and provide potential for the student to fully develop higher order thinking skills. This is the sixth national toy award for “Sports of All Sorts” and the twenty-sixth honor for OOZ & OZ optical illusion kits! 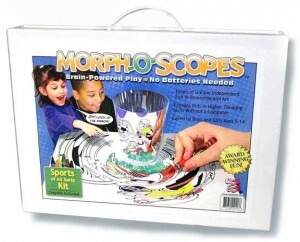 The Morph-O-Scopes “Sports of All Sorts” Kit is a winner of the Academics’ Choice Brain Toy Award in the toy category. The Academics’ Choice Advisory Board consists of leading thinkers and graduates from Princeton, Harvard, George Washington University, and other reputable educational institutions. Product-appropriate volunteer reviewers, combined with the brainpower of the Board, determine the coveted winners. Entries are judged by category (i.e. mobile app, toy, book, website, magazine, etc. ), subject area, and grade level, and evaluated based on standardized criteria rooted in constructivist learning theory. The full list of winners is posted online at www.AcademicsChoice.com. Academics’ Choice™ helps consumers find exceptional brain-boosting material. Academics’ Choice is the only international awards program designed to bring increased recognition to publishers, manufacturers, independent authors and developers that aim to stimulate cognitive development. A volunteer panel of product-appropriate judges, including parents, educators, scientists, artists, doctors, nurses, librarians, students and children, evaluate submissions based on educational benefits such as higher-order thinking skills, character building, creative play, durability and originality. Only the genuine “mind-builders” are recognized with the coveted Academics’ Choice Award™.